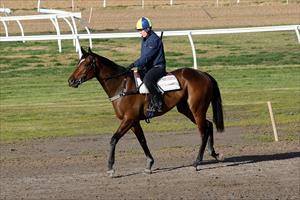 Two runners for the stable on Friday including Pueblo making his Australian debut. Pueblo runs in race one at Geelong, the 3YO Maiden over 1340m with Patrick Moloney to ride. The field has been reduced to seven with scratchings and the track now rated heavy(8) following overnight rain. Pueblo was purchased as a yearling in Kentucky and like so many of High Chaparral’s offspring, has taken time. “He’s been taking his time to pick things up but he’s improving all the time,” Mike Moroney said. “The penny is definitely starting to drop with him and it will be interesting to see how much improvement he’s taken from his last jumpout. “The more we’ve done with him the better he’s got - he doesn’t appear to possess a lot of gate speed so we will likely go back, give him a chance to balance up and see if he can run home. “It doesn’t look the strongest race and it will be good to get him to the races and see what he has. Metson (pictured) runs for the second time this campaign later in the day at Cranbourne’s night meeting in race six, the Benchmark 64 Handicap over 1300m with Patrick Moloney to ride. “I though the run was better than it looked,” Moroney said. “It was a strong race worth $150,000 and he was slow away which put him on the back foot. “He’s drawn wide tonight and I don’t see that as a problem around Cranbourne - he should be able to take a sit with cover and then wait until the home straight.